Learning how to deal with Double Roundabout! A single roundabout is often challenge enough for many drivers, especially learners. A double roundabout is of course double the challenge. Double roundabouts come in both forms, normal roundabouts and mini roundabouts. Although the same rules apply to both types, a very different approach needs to be taken. 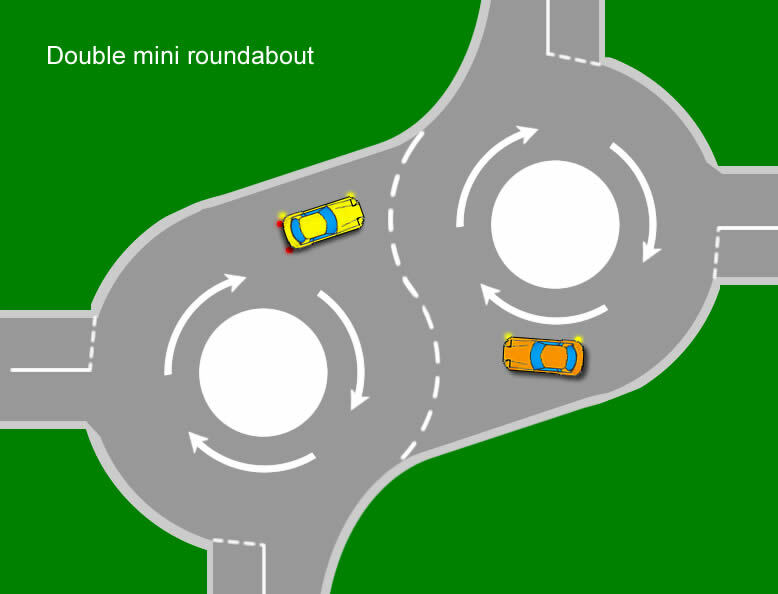 You will certainly be taking roundabouts during a driving test and if double roundabouts exits within the driving test routes, there’s a good chance you will be taking these too.This tutorial offers advice for both normal and mini double roundabouts along with the rules. The key to dealing with any double roundabout is to deal with both roundabouts separately. Below is a diagram of a large double roundabout. which exits off onto dual carriageways. We’re going to be following the red car which is following the correct driving test procedure for turning right at the double roundabout. As with normal roundabouts, the MSPSL (Mirror, Signal, Position, Speed and Look routine must be applied. See the MSPSL driving routine for further information. A. Whilst approaching the double roundabout, look into the interior mirror followed by the right wing mirror, then indicate to the right. Make your way into the right hand lane. If you were previously in the left lane, ensure you check the right blind spot before indicating and before changing lanes. B. Give way to the right and when all clear, proceed into the inside right hand lane on the roundabout. C. Just after the 2nd exit, look into the interior mirror, followed by the left mirror. You will be changing lanes so check the left blind spot, now indicate to the left. D. As you take the 3rd exit, keep in the right hand lane as you will be turning right at the next roundabout. E. Look again into the interior and right mirror and indicate to the right. F. Give way to the right. G. When clear, enter the roundabout using the right inside lane. H. Just after the 2nd exit, look into the interior mirror, followed by the left mirror and the left blind spot and indicate to the left. I. When you have taken the 3rd exit, ensure you cancel the indicator. The above rules are usually how to deal with double roundabouts. Very big multi-lane roundabouts may have more lanes however. In such circumstances it is important to check road signs and road markings for correct lane information. Double mini roundabouts can often be found on smaller residential busy roads. A great deal of caution should be applied when approaching to assess what the other traffic is doing. Although double or multiple mini roundabouts may appear confusing, treat each of the roundabouts as individuals. From the diagram, the yellow car wants to turn left at the second roundabout but needs to give way to his right for the orange which is turning right. Due to the small proximity of double mini roundabouts, approach slowly, keeping a keen eye on other vehicles indicators and the angle or their car. If you approach slowly and it looks like you may need to give way, you can stop safely and in time. Double Mini Roundabouts And Cyclists! Cyclists can often be unpredictable and can often not use arm signals to indicate their change of direction. Always approach mini and double mini runabouts slowly so you can take effective observation. If cyclists are located at the roundabout, use extreme caution and do not try to push past. Related Roundabout Guides And Tutorials!